The American Motorcyclist Association (AMA) has announced that Tissot, the Swiss luxury watch brand, will present the AMA Racing Athlete of the Year and ATV Athlete of the Year with Tissot watches at the 2009 AMA Racing Championship Banquet on December 4 at the Hard Rock Hotel & Casino in Las Vegas. 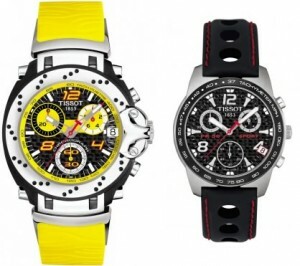 Tissot watches, due to their sporty nature, durable build and precise timekeeping are often used in events like race car driving and motorcycle races. Tissot has always been on the forefront of watchmaking and technology. They were the first company to implement a tactile touch technology, known as the T-Touch. These Tissot watches have touch-sensitive sapphire glasses and are technologically advanced with barometers and compasses. how about price is black one?